"Don't worry Sidney, I've hustled players a hell of a lot better than you." Director Ron Shelton has made quite a career out of writing and directing jock flicks. As a matter of fact, five of his six directorial credits and eight of his ten screenplay credits are for films whose plots revolve around one sport or another. 1988's Bull Durham, which he wrote and directed, has probably been his crowning achievement thus far. Additionally, he has either written or directed (or both) films about football, baseball, golf, boxing, and, in this case, basketball. His screenplay for 1994's Blue Chips concerned itself with the seething underbelly of high-stakes collegiate basketball. White Men Can't Jump, on the other hand, concerns itself with the low-stakes gambling common on inner-city courts. In Martin Scorsese's The Color of Money, Vincent utilizes his inherent flakiness as the basis for his pool hall hustling technique. 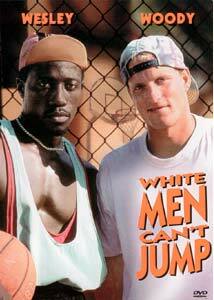 In White Men Can't Jump, Billy Hoyle uses something more inherent, his "whiteness." We meet Billy as he scopes out public courts at Venice Beach, where virtually everyone that plays is black. When these regulars see a white man waiting to play, he is automatically labeled a "chump." Billy gets involved in the game and soon hustles court regular Sidney Deane out of $62 in a 3-point shooting contest. Sidney realizes he has been hustled, but instead of getting mad, he follows Billy home and offers him a business proposition. Sidney realizes what a potential goldmine Billy's ethnicity could be on the public courts of Los Angeles and knows that, together, they could make more money than each could working alone. Billy takes Sidney up on his offer because he needs the money. He and his Puerto Rican girlfriend, Gloria, live in a seedy motel both to save money and to hide from the loan sharking Stucci brothers, whom they owe $8000. While Billy spends his days hustling, Gloria spends her days studying reference books so that she can get on Jeopardy and win lots of money. There are personality conflicts abundant. Billy may be a cool customer on the court but off the court he is impulsive and his gambling problem is growing. This does not sit well with Gloria, who wants him to help her pull themselves up by their bootstraps into a more respectable life. Sidney and Billy, due in large part to cultural differences, have a very hard time getting along and do not really trust one another. Sidney is also receiving pressure from the home front as he has a demanding wife, children, and a nice apartment to finance—and his day job revenue just isn't cutting it. Where this film takes us in its broad strokes is generally, but not quite, predictable. Billy and Sidney eventually play in the "big game" (a city-wide 2-on-2 basketball tournament with huge prize money for the winners), Gloria does get on Jeopardy, and Billy does have his inevitable run-in with the infamous Stucci brothers over his debt. Shelton does come through with some respectable plot twists but this is not the real allure of this film. Its gift is in the small things. White Men Can't Jump features good performances throughout. Snipes (Sidney) and Harrelson (Billy) team up for the first time in starring roles. They previously appeared together in supporting roles in 1986's Wildcats (yet another sports film) and would team up as stars again in 1995's far less successful Money Train. Rosie Perez, despite her incredibly annoying voice, turns in a charming performance as Gloria and is the brightest gem in this cast. She and Harrelson possess real chemistry on camera. Tyra Ferrell, previously best known for playing Doughboy's mother in John Singleton's Boyz N the Hood does solid work as Sidney's exigent wife, Rhonda. White Men Can't Jump's real gift is its smart, funny dialogue. It is clear that Shelton did his research in capturing the aura and style of inner-city basketball courts, where physical and verbal intimidation are just as inherent to on-court success as actual basketball prowess. This film only falters in that it is never quite able to decide whether it wants to be a comedy, a quirky romance, or a sports drama. This indecision does adversely effect its cogency but not so much its ability to entertain. Image Transfer Review: Considering this is an eight year-old film, the anamorphic video transfer looks fantastic. I could not find a trace of graininess. Both the sunny outdoor and gloomier indoor shots demonstrate very good clarity and color. You will see some small amount of film blemishing, but only if you look very hard for it. Black levels and flesh tones both pass muster with high marks. Fox continues to impress with the care it has given the video on its recent releases. Audio Transfer Review: Despite some internet information to the contrary, White Men Can't Jump features only a Dolby 2.0 Surround audio transfer, available in English and dubbed French. Don't let this dissuade you, however, because it is a very solid offering. The surround track is mainly put to use to offer additional dynamics to the frequent music. Every sound, from the sound of basketballs striking the court to the dialogue itself is crisp and clean. Only in the game scenes themselves might this film have benefited greatly from more enhanced, multiple-channel surround sound. Most of the film is dialogue driven and the offered audio does well in separating the foreground dialogue from the background atmosphere and allowing both to be heard distinctly. Extras Review: White Men Can't Jump is not particularly strong in the extras department. In addition to two theatrical trailers and one TV spot, the musical artist Riff's video for White Men Can't Jump is included. The music video's image quality is consistent with the rest of the film, is presented in 2.0 Surround, and does feature cameos from the film's three main stars; Snipes, Harrelson, and Perez. The main menu is full motion while the sub menus are static, but music from the film plays on all. No commentary track, featurette, production notes, or cast and crew information is provided. Ron Shelton truly is the king of sports films, and this is certainly one of his better efforts. With witty dialogue and robust performances, White Men Can't Jump is a film that is eager to please. The disc features exception video and above-average audio. Only the scantiness of strong extras prevents this from being an ideal catalog title DVD release, but fans of the film will still find plenty to cheer about.